It's a convenient online design tool that lets you use starter templates to quickly create beautiful, professional designs online in minutes. 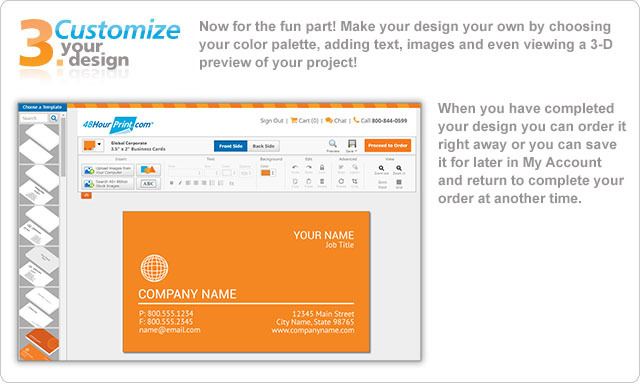 You can create a business card for your Mom in 5 minutes then load it up in your shopping cart for easy ordering. Will it cost me anything to try it out ? Not a penny. Create48 is FREE to anyone with an active 48HourPrint.com account. You'll be prompted to log-in to your account or create an account to use this tool. 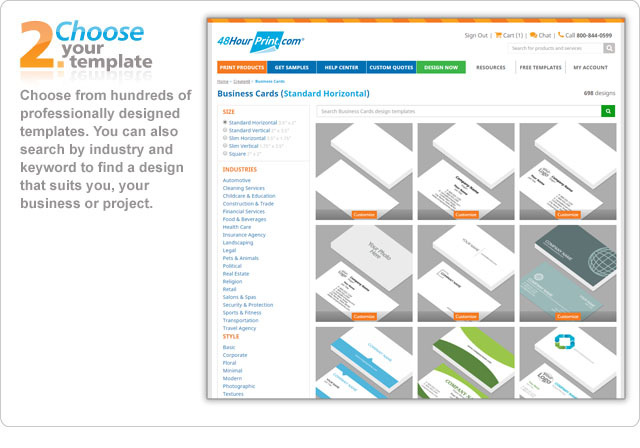 Any designs you work on can be saved in Draft form in your my Account area until you're ready to get them printed. What if I started designing something but am not ready to print yet ? You can store Drafts of your designs-in-progress in your My Account area and come back again when you are ready to finish your design. How Does Create48 Work ? Designing Online with Create48 is as easy as 1 - 2 - 3! Just create an account or log-in to your existing 48HourPrint.com account and . . .